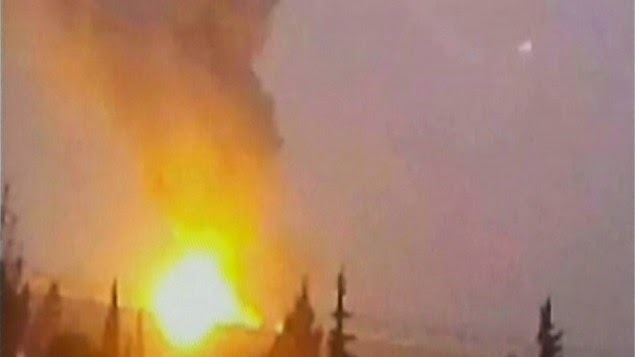 The targets were military sites at Damascus’s main airport and at Dimas on a key road near the Syrian-Lebanese border. “The Israeli enemy attacked Syria by targeting two security areas in Damascus province, namely the Dimas area and the area of Damascus International Airport,” said SANA, adding that no casualties were reported. The Syrian Observatory for Human Rights said the target at Dimas was a military position, and the strike near the airport hit a warehouse. Comment: The Israeli attacks on a warehouse near the airport and a site in Dimas, half way between Damascus and the Lebanese border, probably point to attacks on a weapons storage warehouse near the airport and on a possible shipment of weapons en route to Hezbollah in Lebanon. Iran is believed to regularly ship its Fateh-110 ballistic missiles to Damascus airport for use by the Syrian military and the Hezbollah. "...probably point to attacks on a weapons storage warehouse near the airport and on a possible shipment of weapons en route to Hezbollah. Iran is believed to regularly ship its Fateh-110 ballistic missiles to Damascus airport for use by the Syrian military and the Hezbollah." There is a competing regional narrative that the IAF strikes are in support of a JAN advance towards Damascus. there's also a narrative that it was Santa's elves riding an advance party of reindeer laden with rocket bombs rather than gifts for kids. were the Israelis supporting some party in the war, they would have destroyed the Damascus airport runways and control towers.....as well as all the other airports still controlled by the Assads. Zionists have been attacking Syria and other Arab nations with impunity because they don't hit back. The Arabs need to learn school yard bully rules, always hit back at your tormentors no matter how strong they may be and always impose a cost. Attacking the Zionist occupation army on Golan is within UN right of self-defence rules. It is indeed true that the Zionists are supporting al-Nusra terrorists to create a buffer till Sassa ridge near Damascus so that they can annex more lands. Syria is already decimated and has nothing to lose if it fights back. "they would have destroyed the Damascus airport runways and control towers.....as well as all the other airports still controlled by the Assads." ==> That would be an open declaration of war and Syrian forces would finally be compelled to react, most probably with Arab League support this time, bar a couple of GCC petro-monarchies of course. I'd rather say the IDF has carefully been selecting the scope and targets of its highly opportunistic strikes since the beginning of the civil war so as to effect maximum strategic damage to the Syrian army's war effort and morale every step of the way whenever they judge necessary, while at the same time making sure there aren't enough incentives for more hard-line elements among Assad's close military circles to go it alone in retaliatory action that would be justified in every way should it materialize in the eyes of the people, whose support has been tilting back in loyalists favor since JAN and other Jihadist, Al-Qaeda linked groups emerged and completely overshadowed a now barely existent FSA. Israel in turn, despite its obvious military advantage against a war-torn Syria and its dispersed and overstretched forces, would then have quite a hard time justifying such major escalation to its people while it is secret to none that the IDF has been performing unprovoked strikes on Syria every now and then since the civil war started, and even as far back as 2007. It would be a risky gamble for both parties to open a new front like this, and nobody on Earth knows today how it would influence warring parties on the ground currently at odds in the country. A UN report released yesterday clearly established regular contacts between local anti-Assad commanders and the Israelis at the Golan frontier, and a 10-million dollar package was delivered straight from the country's military coffers to provide field hospital services for them. I let you see for yourself what kind of anti-regime fighters and groups are in control in the area today. Besides, last time a Syrian jet was taken down by Israeli fire, it was over a region of the Golan temporary under JAN's control, and we have yet to see any kind of even indirect references of the group about Israel, or any action of the latter against the former's forces on the ground. After all Israel's current government isn't renowned for its lack of cynicism when it comes to relying on every "friend" possible to weaken its enemies and prevent them from getting on their feet again as long as it proves possible. "were the Israelis supporting some party in the war, they would have destroyed the Damascus airport runways and control towers"
let me rephrase this : "would the Israelis NOT be supporting any party of the war, they would NOT have used the current situation to perform ANY devastating strikes, let alone solely on regime targets and regime-controlled territories." How's that ?
" That would be an open declaration of war and Syrian forces would finally be compelled to react "
in case you don't know it...Syria and Israel are still technically at war and have been for for a hell of a long time. the Assads have refused to hold peace talks and said that the return of the Golan Heights has to come prior to any formal peace talks. as for the Arab League, joining the Assads in some fighting against Israel...you've got to be kidding. not a snowball's chance in hell of any such thing happening. the Saudis and the rest of the GCC states want the Assads gone. the Arab League would issue a strongly worded condemnation of Israel and that would be the end of it. as for the Arab League, joining the Assads in some fighting against Israel...you've got to be kidding. not a snowball's chance in hell of any such thing happening. the Saudis and the rest of the GCC states want the Assads gone. ==> I already addressed that part, and what I was talking about was merely an official stance paving the way for more action legally, not that the Arab League matters in any way more than the UN and its non-binding resolutions. the Assads have refused to hold peace talks and said that the return of the Golan Heights has to come prior to any formal peace talks." ==> almost every Israeli official in power since 1973 has made explicitly clear to the Assads time and again that they will never give up the Golan. No more than they have been willing to give back East Jerusalem. Pointing fingers at Syria on that matter is beyond ludicrous anyway considering who is the occupied and who is the active occupier. So the fact that they are technically at war allow Israel to take advantage of a crippling situation on the ground that prevent Syrian forces from retaliating to every abuse it pleases ? seems like a hell of a noble state behavior you're supporting here. Probably quite the usual trend for anyone in 500 B.C. but a bit more problematic morally in 2014. So what you're basically implying here is that Israel can do whatever it wants to Syria and Syrians relying only on the cheer force of its firepower to accomplish that. And so despite a UN-recognized ceasefire line existing on the Golan front since 1974, respected to this day by the Syrian side, with not a single cross-border attack of any kind or the slightest level recorded by any observer since that date on their part, while Israel has been constantly upping the ante on a growing number of aggressions since the mid- 1980s (by then USSR supported Syria had the power to retaliate and take down IDF places on every once in a while, but it stopped from being the case past 1991), reaching the current peak with the start of the civil war knowing that chances of retaliation are close to zero. And the world sees them acting as such with total impunity and in defiance of every international norms possible, and yet all you find to blame is ... the Syrian side. Congratulations, you're a certified zionist ideologue supporting the Israeli state in its abusive actions every step of the way without caring about even basic logic and facts before formulating an pseudo-assertion.